As you may know, every month we compile the millions of data points that we track. Collecting so much data on an ongoing basis allows us to refine and update the most accurate sales estimates and algorithms of Amazon data in the industry. As a proud data nerd and FBA seller, I have a ton of fun in having so much data readily accessible! Our data scientist updates this table on a monthly basis. 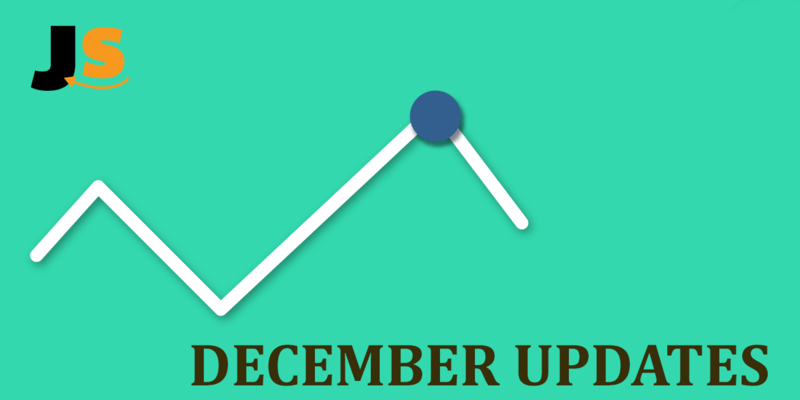 You can get the full table for December and automatically get monthly updates if you sign up for free here. I am really excited to see how the fourth quarter finishes (I am definitely expecting, and seeing, some big increases over November!). Stay tuned….. I am a marketing PhD student. I am working on a project that looks at efficacy of different promotions by online retailers. I am looking for amazon data (Big data) that will contain data on units sold for a particular product (or a bunch of products) as well as the type of promotion they are using for the product (products). Do you have any idea if getting that type of data is possible? If yes, then from where I might get that? Just PM you via your fb apge. Look forward to hear from you. 1. Can you explain what the significance of this table is? 2. Can we uses the sales results in order to determine which product categories we should be targeting for the coming months? Like why does the BSR difference between categories matter in selecting which category to sell in? 1. This table helps you understand what the average estimated sales are for a given Best Sellers Rank. So when you are doing your product research and have specific goals of sales per month/day, you can use the table as a reference to know how many sales a given product category is getting for the various BSR. 2. The sales results for December may not be as helpful for predicting sales volumes in, say, February (you may want to reference Google Trends for seasonality and broader trends). However, comparing different categories for the same month can be helpful so that you can get an idea of how “deep” a category is. 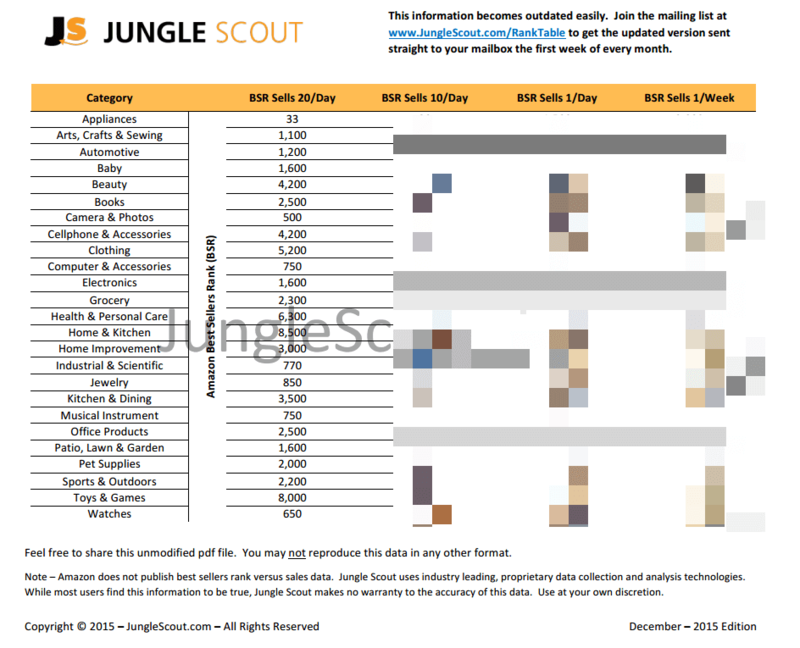 For example, a BSR of 8000 in Toys sells 20/day, while a BSR of 750 in Industrial & Scientific sells 20/day. So you can gauge by that alone that you are going to see a lot more demand in some categories over others. Hope this helps, let me know if you still have questions! I’m not sure if this is your first product or not but in regards to the yoga mats, if you do an amazon search with the keyword “yoga mats” using jungle scouts chrome extension tool you will find that on the first page alone the top sellers have 1852, 2587, 1225,1622,1107 reviews. Additionally they are each selling 2000+ units a month with an estimated revenue of roughly 50k per month each. I would consider this product to be an over saturated market and would be hard to get in to because of the sheer volume of product being sold. It would very hard to overtake these heavyweight sellers and get to the first page (which is essentially to selling products). I have a question about particular product. So i posted a question on a facebook group about my product which is yoga mats that im in the process of ordering from China, and I got a reply from one of thr members that this market is over saturated due to the exaples that a lot of Amazon gurus use. Is it true? Should i reconcider ordering my yoga mats? I searched on Amazon and the once Im ordering are not as popular I could only find 5 supliers. The rest are the same. Hello Greg. Thank you for your hard work and great information. I would like clarification on one aspect of your chart. For example, in Health & Personal Care, your chart says BSR Sells 20/Day = 6,300. Does that mean if your BSR is 6300 then you are selling 20 units per day? Thank you. Hi Rendell, you are exactly right in reading the chart.